On the second anniversary of Fukushima, the Helen Caldicott Foundation and Physicians for Social Responsibility (PSR) are sponsoring a symposium in New York City on the medical and ecological consequences of that accident (full details below). I interviewed the eminent Dr. Caldicott on why activists who want to close San Onofre Nuclear Waste Generating Station should pay particular attention to this symposium and, if possible, make the trek to Gotham rather than watch the symposium on the web. "It would give them an enormous amount of information from a biological and medical perspective. It's a MEDICAL problem, not just now but for all future generations." "It depends if it's like Chernobyl -- high in the air -- or like Fukushima -- close to the ground. Many will suffer from acute radiation illness: Hair falling out, diarrhea, blood system breaking down. There are eight million people within a 50 mile radius of that plant. Many may die in the first two weeks following a release, depending on the size of the release. Following the acute deaths, there will be a large increase in complications to the immune system -- children are particularly vulnerable. Within five years you'll see a large increase in childhood cancer, and thyroid problems in children, as we've seen in Chernobyl and Fukushima. 15 years later, large increases in cancers of the bodily organs, also babies born with very severe deformities, and spontaneous abortions. Increases in cataracts. Premature aging of children and everyone else, increases in diabetes, heart attacks..." her voice drifts off, the list is too long to name them all. "The land will be radioactive for hundreds of thousands of years, the food grown will be radioactive, so people will be eating radioactive food for thousands of years. The accident never ends, it's ongoing, there will be an increase in malignancies, and genetic disease, as the genes in the eggs and sperm are mutated, and those abnormalities are passed on for generations." "I think it's very important to be there (at the symposium), to meet the scientists, ask them questions, talk to other people. The nuclear industry is even expected to attend; we're hoping we can teach them something." Dr. Caldicott has more than 50 years of experience studying the medical effects of radiation. A Harvard-trained and practiced medical professional, her credentials are impeccable and she can describe the components of a nuclear bomb just as well as she can describe the horrific medical effects to humans from radiation -- a remarkable person, full of knowledge we all need to hear. I encourage everyone to try to attend this important symposium next month, either in person or via a webcast that will be provided at no charge. This is a remarkable opportunity to hear from world-class experts! Also, today at 2:00 pm PST in Vista California, Torgen Johnson and the author will be giving a presentation about San Onofre. Details appear below. Also, if you haven't checked out the OC Weekly front-page article by Ned Madden about your humble and obedient servant, please do so! There are also some follow-up comments and blog posts by the author at the OC Weekly web site ( www.ocweekly.com ). Lastly, a new movie about Fukushima called 3.11: Surviving Japan is premiering around the country around March 11. If they can presell enough tickets by March 4, it will play, in California, in San Diego, Laguna Niguel, North Hollywood and San Francisco. The showtimes do not conflict with watching Caldicott's symposium on the web or even attending it in person (the movie is scheduled to play in New York City on March 12). Ace Hoffman aka "Don Quixote"
Carlsbad, CA aka "La Mancha"
Sunday, Feb 24, 2013, 2-4pm, Transition North SD County will present a program on San Onofre Nuclear Waste Generating Station (SONWGS), featuring urban planner Torgen Johnson, Ace Hoffman, and Tom English, who will sing "What part of Fukushima do you not understand?" Vista Library, 700 Eucalyptus Ave, Vista. Registration, a complete line-up of speakers, and more info is here. And if you absolutely can't get to New York City those days, the event will be livecast on the web. A two-day Symposium will be held at the New York Academy of Medicine, New York City, New York, US on March 11-12, 2013, the second anniversary of the Fukushima accident. The Symposium will be addressed by international panel of leading medical and biological scientists, nuclear engineers, and policy experts who will make presentations on, and discuss, the bio-medical and ecological consequences of the Fukushima disaster. The Symposium will be chaired by Donald Louria, MD, Chairman Emeritus of the Department of Preventive Medicine and Community Health of the University of Medicine and Dentistry, New Jersey, US. The symposium is a project of the Helen Caldicott Foundation and is open to the public. The event will be chaired by Donald Louria, MD: Chairman Emeritus of the Department of Preventive Medicine and Community Health, University of Medicine and Dentistry, New Jersey. Akio Matsumura, Founder of Global Forum for Parliamentary Leaders on Global Survival ­ What did the World Learn from the Fukushima Accident? 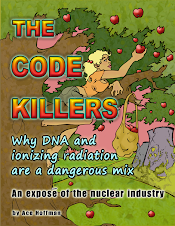 Arnie Gundersen, Nuclear Engineer, Fairewinds Associates ­ What Did They Know and When Did They Know It? Andrew S. Kanter, MD MPH FACMI, Immediate Past-President of Physicians for Social Responsibility ­ Moderator, Health Effects Panel. or contact Mali Lightfoot, Executive Director of the Helen Caldicott Foundation at MaliLightfoot@gmail.com or telephone 001 617-650-5048.